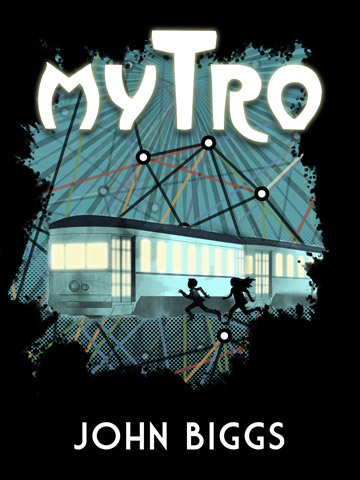 Mytro is a new fiction book by John Biggs for readers of all ages. You can buy the ebook on Amazon here. Want to give it a try? Get 10 free chapters with a Tweet or enter your email address below to join our Mytratti Mailing List. We'll be notifying you when the next two books arrive in stores. Want to learn more about Mytro? Click here. We will never sell your info. Ever. The jackhammer stopped and the trill of birds replaced it in the quiet. Somewhere, over a low hill, Turtle heard the sound of traffic - a bus stopping with a whine of hydraulics, a horn beeping once in warning, the rev of a high-powered motorcycle peeling out into the street. He knew that the rest of the track team was somewhere far ahead, but there were more pressing matters. Turtle looked carefully at the bushes, convinced the twins were hiding there somewhere, but in a few seconds he had confirmed what he suspected: the boys were gone. Take a ride on the Mytro! Thanks! Download your chapters now! You can download an ePub (Nook, iBooks) or mobi (Kindle) copy of the first ten chapters here. Want to read it right now in your browser? Click here.